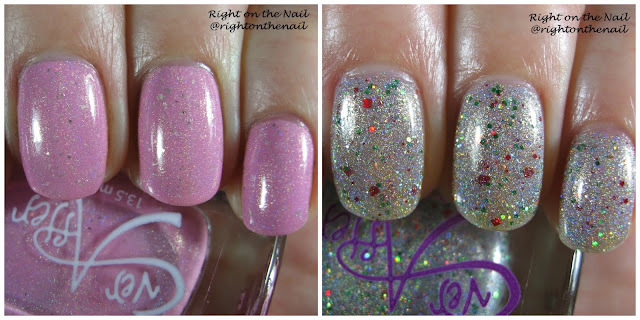 Tonight I have a new brand to the blog named Ever After Polish. They have both hand and body care as well as nail polish from the duo Rachel and Miranda. I just joined their Facebook group recently and it's so fun to see all the swatches. I ordered during the sale they had for Black Friday so I have several colors to show you. Shall we see what they had in store for their holiday collection? Are you kidding me?! How gorgeous is Princess Christmas Cake? I wouldn't normally think of a light pink holographic polish with silver flakes to be Christmas-y, but I'm still all for it. This is definitely a unique color in my too huge collection. I had no issue with the formula and it only needed 2 coats for full coverage. I approve this polish! My nails are actually less yellow now than in previous years (and I'm so excited about that)! If your nails are a bit stained or yellowed, you may want to use a base layer with Twinkle All the Way because it is a bit sheer. Pictures always show sparse spots, so any you may see above are not as noticeable in real life. Ok, with that disclaimer, Twinkle All the Way is a silver holographic glitter with larger red and green glitters. It's sheer, but the formula and application was seamless. These look great on you! So glad you enjoyed them.